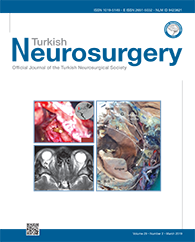 1Ankara University, Faculty of Medicine, Department of Neurosurgery, Ankara, Turkey DOI : 10.5137/1019-5149.JTN.21878-17.2 AIM: To present our experience of 225 clipped aneurysms in 196 patients to compare indocyanine green video angiography (ICGVA), micro-Doppler ultrasonography (MDUSG), and postoperative digital subtraction angiography (DSA) in terms of determining aneurysm obliteration, neck remnants, and parent artery patency. MATERIAL and METHODS:This retrospective study included 196 patients (108 female and 88 male patients) treated between 2013 and 2016. In all cases, aneurysm neck remnants and vessel patency were assessed using ICG-VA and 16-Hz MDUSG. DSA was performed in every case postoperatively within the first 5 days. RESULTS: The mean patient age was 55.8 years (range, 31-80 years), and the mean follow-up duration was 25 months (range, 2-48 months). Of the 225 clipped aneurysms, 86 were located in the anterior cerebral artery and its branches, 103 in the bifurcation of the middle cerebral artery (MCA) and the branches of the MCA, 34 in the internal cerebral artery and its branches, 1 in the posterior inferior cerebellar artery, and 1 at the basilar apex. We observed 2 neck remnants (0.8%), 2 parent/perforating artery occlusions (0.8%), and 2 residual aneurysm fillings (0.8%). There were no striking differences among the assessed methods.